Seeking beauty and elusive light for over twenty years, my photography has led me to many adventures across remote wilderness over six continents. Emerging somewhat naturally, and somewhat unexpectedly, my orchid images synthesize two of my passions: growing orchids and photography. 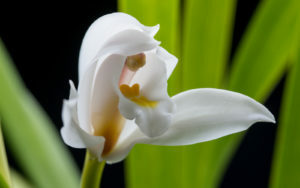 Orchid photography embodies one of my favorite aspects of creating images of nature: macrophotography and botany. Also, orchid photography is possible with much less time and energy required for travel … brilliant forms and colors are always alive and inviting in our own home and yard. My approach to orchid photography is more personal, artistic, and co-creative than scientific documentation of orchid plants and flowers. I prefer to call my form of orchid photography “orchid portraits.” The whole plant, not just the flower, is integral to the image. An orchid can be experienced from many perspectives: my intention is that the series of orchid photographs that I create is like visiting with a friend, having a conversation where you learn something new about someone special and see more deeply. 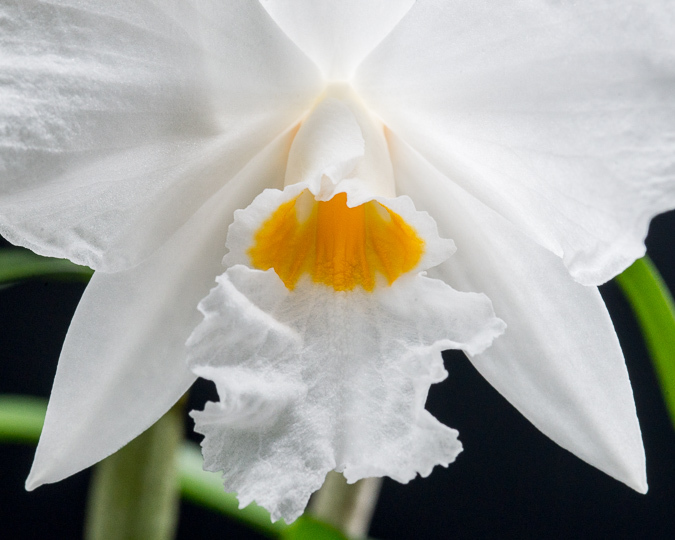 My orchid images focus on species and primary hybrids, the majority of our collection. But there are some unique and charismatic complex hybrids in our orchid family too. Thank you for taking the time to see, feel, and experience the many dimensions of orchids through my photography. 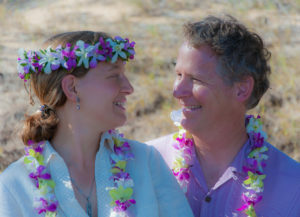 You can learn more about my approach to photography here. The large, varied, and complex genus of Dendrobium spans across Asia, Pacific Islands, and Australia. 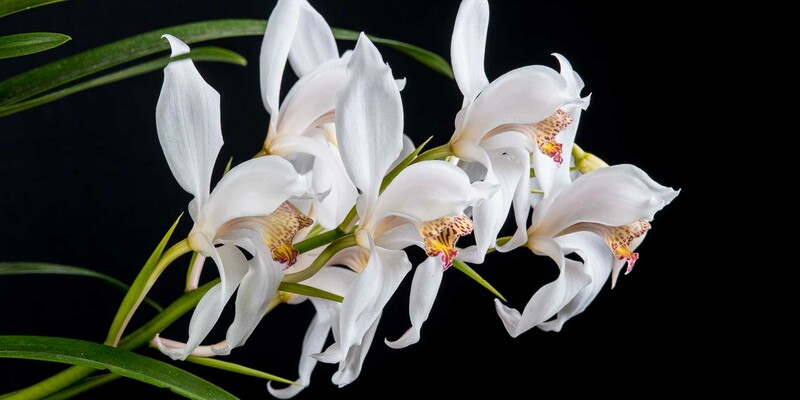 To make my orchid images more easily searchable, I have organized the photographs into three subsections: Asia-Pacific Dendrobium, Australian Dendrobium, and Dockrillia. Our central California climate is ideal for growing Australian Dendrobiums, and most of our Australian orchids spend the entire year outside. I move some northern Queensland species into our indoor cool room for the winter, as sub-freezing nights are well outside of their natural habitat. 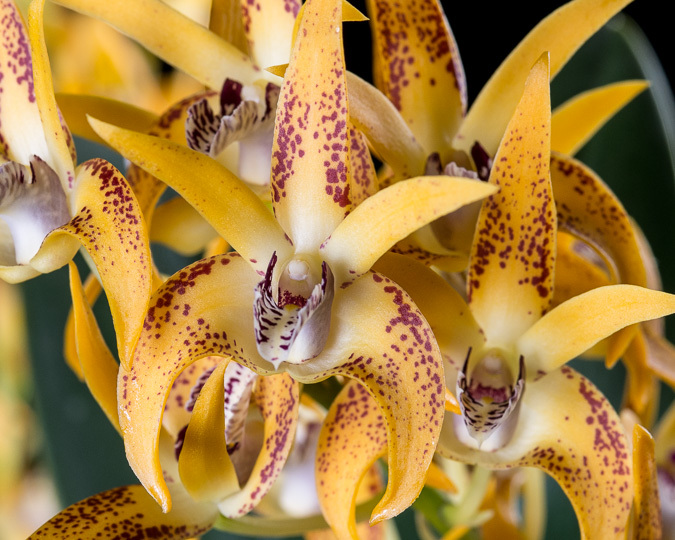 Covering my favorite colors, yellow, white, and pink are the hues of Australian orchid photography. I lived in Australia for a year, as a visiting scientist at the Universities of New South Wales and Adelaide, with the great pleasure to circumnavigate the continent in my Subaru. With many thousands of miles of experience, I have an appreciation for the varied habitats, and, hence, an intuitive connection to the cultivation of these hardy Dendrobium species. Cymbidiums are a wide ranging Asian genus, with some species thriving in areas that receive snow while others grow in hot, lowland jungles. Central California is an ideal growing area for the cooler growing species. Most of our Cymbidiums live outside year-round with the Australian Dendrobium, with a few warmer growers heading to the cool growing area when nights drop below 40F (4C). We focus on species, and hybrids of those species, which grow best in our area: Cymbidium tracyanum, Cymbidium devonianum, Cymbidium madidum, and Cymbidium canaliculatum. 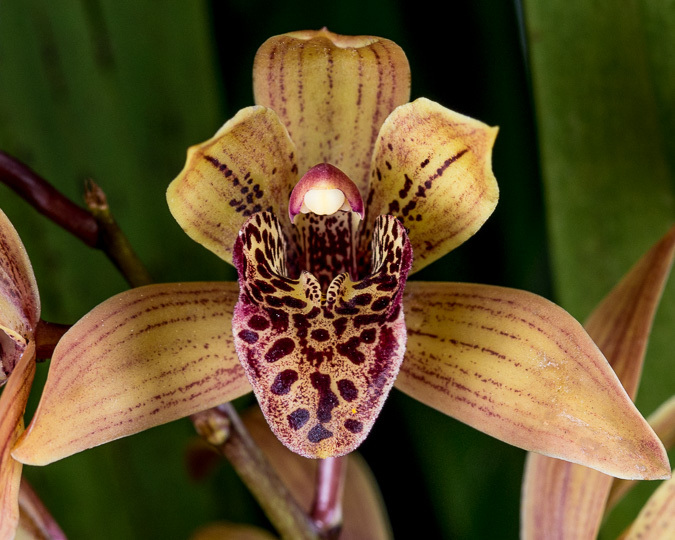 This diversity translates into ongoing opportunities for orchid photography of Cymbidium during most months of the year. One of our favorite Cymbidium floral qualities is lots of spots … amongst the species photographs, you will see our favorite speckled hybrids. Now taxonomically included with Dendrobium, Dockrillia are a visually distinct group. 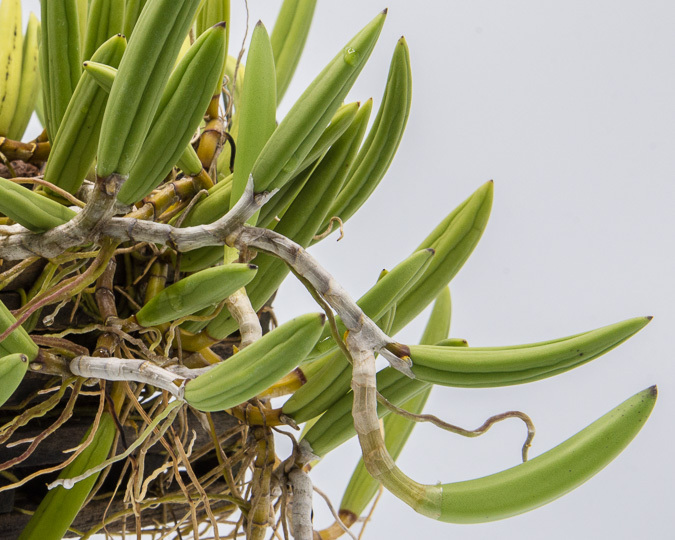 Most people would not even easily recognize Dockrillia as orchids — with leaves that are small, plump and succulent-like or long, drooping strands. This is orchid photography with an eye for the abstract: the plant is as unique and intriguing as the flower. A very hardy group, Dockrillia endure in varying light conditions and withstand dry periods with low humidity. However, most grow best with higher humidity and at least intermediate temperatures. After several trials, the only species and hybrids that I leave outside year-round are Dockrillia (Dendrobium) striolata and its primary hybrids. All others enjoy 50F (10C) minimum night temperatures much more. Paphiopedilum are the orchids of my heart, and amongst my favorite of all orchids. I believe it reflects in the photography: some people say that Paphiopedilum are the best of my orchid images. They are an other-worldly group of orchids, also known as “slipper orchids” for the distinctive shape of the pouch (modified “lip” or labellum). Most our Paphiopedilum collection are species, with a few primary hybrids. We are particularly drawn to alba and flavum forms … again note the theme of yellow and white from my Australian orchid photography. 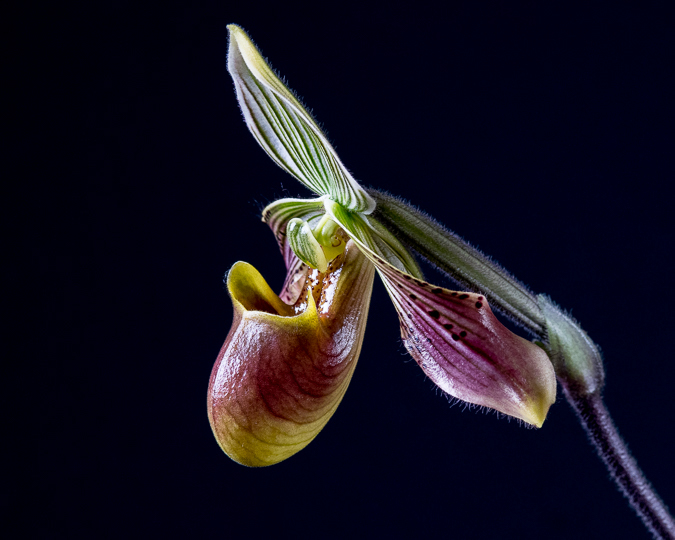 Paphiopedilum flowers often require several days — or longer — to fully open, and I enjoy creating sequences of photographs of the blooming stages. In this section of images, you will find an eclectic assortment of my orchid photography and growing, the unique bright stars of our collection that aren’t Dendrobiums, Cymbidiums, or Paphiopedilums. We have a few hardy friends from the western hemisphere, particularly Rhyncolaelia, Laelias, and Epidendrum species. We particularly focus on species that are both cold and heat tolerant, for successful outdoor growing, as our local climate is increasingly variable, with less constant humidity. 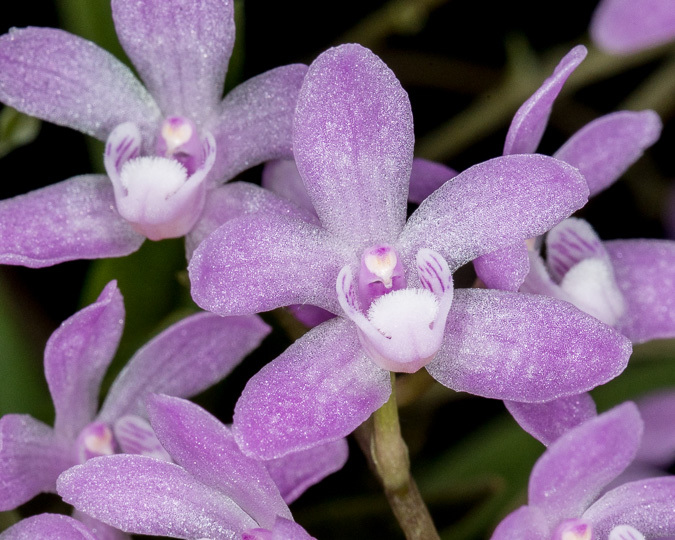 We also love vandaceous orchids, and have several cooler growing Vanda and Sarcochilus species. While they do tolerate near freezing temperatures, I find that even cold tolerant Vandas grow better indoors for the winter (above 40F or 4C).